Amidst challenges, the dynamism of man always reign supreme. its no longer news that Nigeria is going through trying times but do you know that it does not in any way hinder your chances of being a boss! As a boss and entrepreneur, you have to survey the landscape for opportunities Like what is in the prospect of Yuboss. 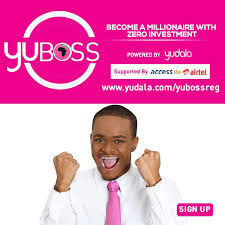 YuBoss by Yudala is initiative that seek to help Nigerians make extra income With Zero capital. How is that possible, you may ask? By becoming a member of YuBoss, Yudala will offer you a chance to you sell products such as the latest smartphones, clothes and lots more with or without capital. All you need do is to market and sell products from the inventory at yudala.com or any of Yudala Offline Stores nationwide and Yudala shall deliver to your customer anywhere in Nigeria and consequently you earn a commission which will be credited to your bank account immediately. The membership will also allow you become part-owners of Yudala franchise stores and receive attractive commissions among other wide range of benefits. As a member of Yuboss, you get to browse Yudala website (www.yudala.com) and call the YuBOSS hotlines as well as other members of YuBOSS League absolutely FREE on Airtel Network. Access bank on the other hand, will make it easy for you to manage your commissions following a recent landmark partnership agreement geared towards the implementation of this new entrepreneurial scheme. Talk to your circle of Friends, Families, Neighbours, Colleagues, Social Media Network, etc. and buy on behalf of them on the Yudala platform. Then EARN amazing commissions on every product purchased. Commissions are paid Monthly to your Accounts. Once approved, your username, YuBoss ID and user guides will be sent to your mail. Join YuBOSS today and set out on the way to becoming your own boss.